What is Fusion Belly Dance? Belly dance is as diverse an art form in Eugene as it is in the rest of the world. There are cabaret styles, tribal styles and fusion belly dance. Fusion belly dance is characterized as Middle Eastern Dance combined with another forms of dance, such as salsa, bhangra, hip hop or burlesque. Although there are cabaret dancers who combine two styles such as Egyptian and Indian bhangra styling, and it would be accurate to call this form of dance fusion, often fusion refers to tribal fusion. When the belly dance style “tribal fusion” is said, Rachel Brice and the Indigo often come to mind. The Indigo’s style of dance consists of several dance styles including tribal (Fat Chance Belly Dance style), cabaret (Suhaila Salimpour technique), popping, locking and ticking (break dance) and even burlesque. The Serpent Rouge Tour has vaudeville, burlesque, 1920’s costuming fused music combined with Middle Eastern dance. Although, Rachel Brice is often considered the poster child of tribal fusion, she wasn’t the creator. 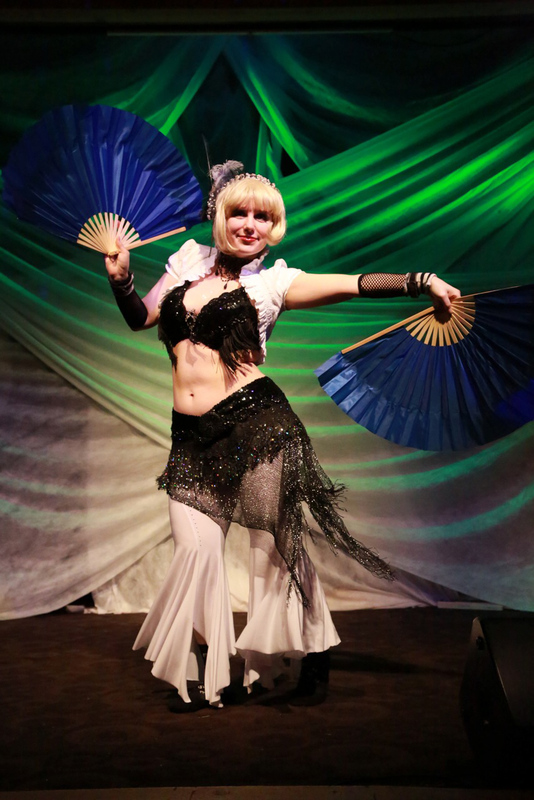 When Jill Parker left Fat Chance Belly Dance and created Ultra Gypsy Dance Theatre, she incorporated elements of cabaret, burlesque and 1920’s dance and changed the costuming away from traditional American Tribal Style (ATS). Another group that blossomed away from traditional tribal costuming and influences was Urban Tribal, influenced by hip hop, street dance and modern dance. Fusion belly dancers combine their style of belly dance with various other dance styles and costuming. A local example includes, Elena Villa who now teaches in Portland. She takes the Andalusian influence in Spain and combines it with elements of flamenco costuming and dance styles in her belly dance, giving it a gypsy flair. Sabine of the Troupe, Tribalation, sometimes combines tribal with bhangra and Bollywood moves and music. Although neither of these dancers consider themselves “fusion” they are fusing dance styles together that were not traditionally meant to be performed together. Some would even argue that ATS is a fusion of cabaret nightclub style dance with folkloric dance in effort to get back to the roots of the dance. Local troupe, Luminessah, who are now disbanded, blended Middle Eastern dance moves with popping set to a variety of musical styles such as local band, Mood Area 52’s tango/jazz flavored music. Although all fusion belly dance stems from Middle Eastern dances, it may have other dance influences as well. It is important to note that performers do not always perform to Middle Eastern music, nor do they have to wear traditional costuming. MEDGE, or the Middle Eastern Dance Guild, hosts one alternative show a year to showcase “alternative” belly dance and Middle Eastern dance that is performed to non-Middle Eastern Music. For individuals with an itch to perform fusion styles or to alternative music, or who wish to support fusion dance, other non Medge events sometimes are available in the area. One such event is Fusion Friendly Events.